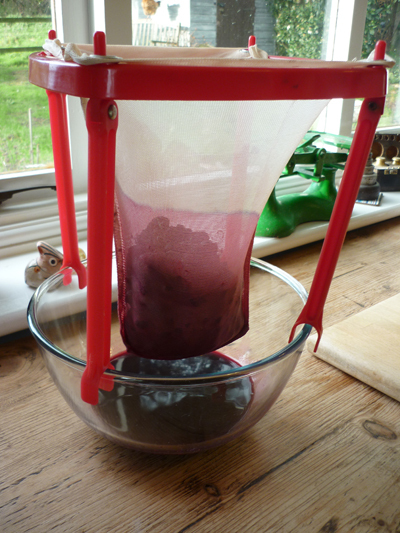 After boiling up the fruit as I showed in my last post you have to drain the fruit through a jelly bag over night. Don’t squeeze as that will make the jelly go cloudy. Measure the liquid and to every 100ml weigh out 75g sugar. 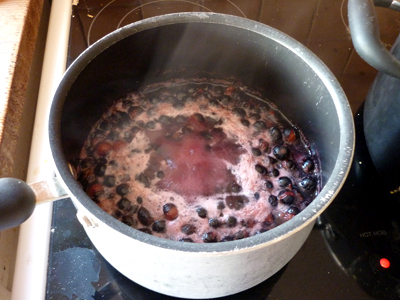 Melt the sugar in the juice before bringing to the boil to get to setting point. Then pot into your warm sterilised jars. 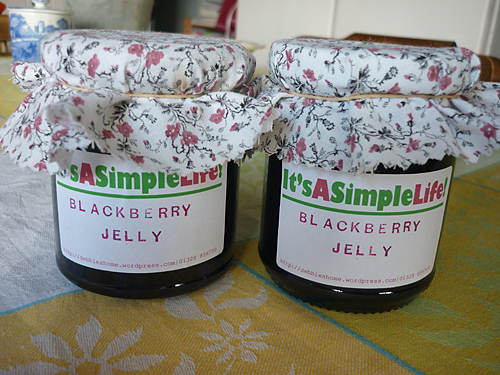 With making jelly, I am always surprised at how little you get compared to jam but it’s worth it because of the flavour. 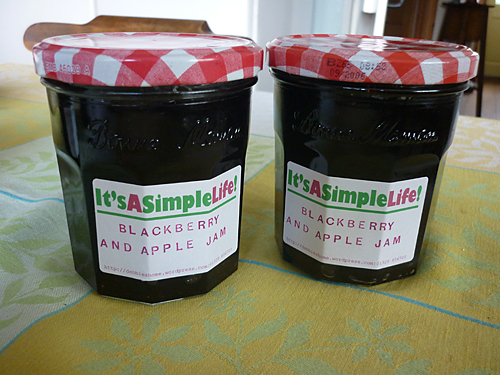 I had just under 300ml of juice so made two small jars. 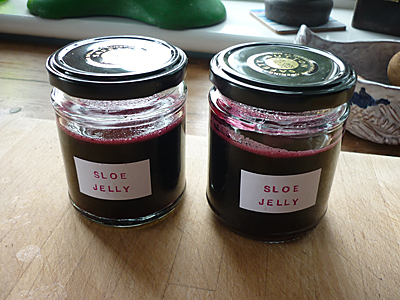 I have never made sloe jelly before and it’s not set yet, but it has a lovely aromatic flavour with quite a dry after taste but I think it could replace cranberry sauce with turkey easily. and then every so often to encourage the mingling of the flavour!!! 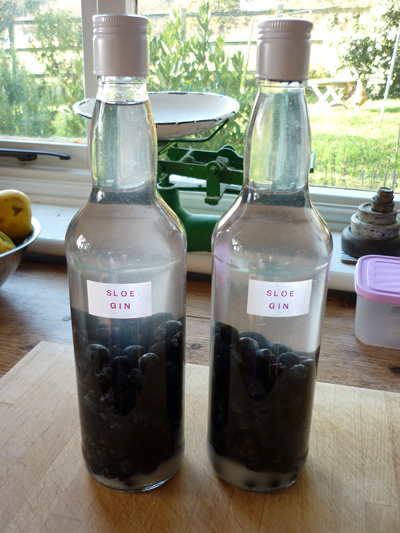 I did actually pick more that I needed and I didn’t really want to spend any more money on gin so I’ve found a recipe for sloe jelly which sounds very nice and I have started that too. They actually smell quite lovely while they are cooking. This is a really obvious tip bit I urge you to do it. Get your friends and family to save you their empty jam jars. They soon mount up and you will have to do some preserving just to give yourself some space! 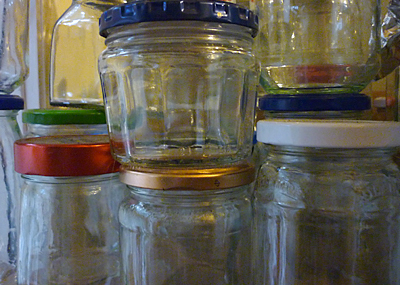 Not only jam jars but pickle jars, sauce bottles …… and then the worlds your oyster, you can preserve anything!!! I’ve done quite a lot of preserving before, but I’ve never made quince jelly. A friend of mine gave me some, so I decided to give it a go. I generally have a look through my own books for recipes and then on the web and then finally choose which recipe idea I like the best and/or has fewest ingredients because thrift is my middle name at the moment! I came across this recipe from the cottage small holder which I decided to try this time and it was easy to do and tastes really good. I drew my label using my graphics pad on my computer.